We’ve looked at many marketing strategies in Data-Driven Marketing so far, from PR to SEO to paid ads and email and more. As B2B marketers, we’re experimenting with all these methods in pursuit of scalable channels for customer acquisition. And while every initiative, campaign, and channel requires analyzing its own bespoke metrics to understand the mechanics, you need to keep all the work tied back to the ultimate indicator of a healthy growth engine: your Customer Acquisition Cost (CAC). Without a flexible, curiosity-driven approach to marketing analytics, you won’t be able to understand how specific strategies—and their combinations—are contributing to or detracting from this goal. 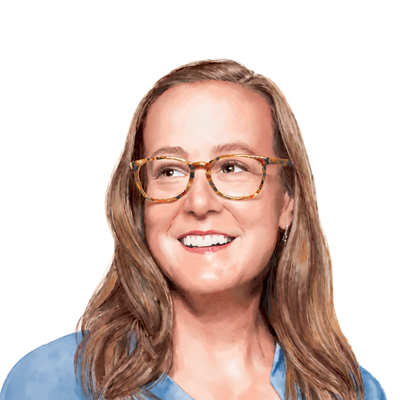 As Marketing Director at Mode, I see marketers from hundreds of companies asking how they can measure their work and prioritize initiatives accordingly. The answer always boils down to understanding the funnel and asking really hard questions. And a great marketing analytics practice is constantly evolving: the metrics you track, tools you use, and workflows you follow to investigate questions all deserve careful consideration and regular updates. I sat down with marketers and analysts at Unbounce, Algolia, Envoy, and Typeform to learn their approach. We got into the nitty gritty of analytics and how their practices and challenges have changed as their businesses have grown. In this chapter, we’ll look at their marketing funnels, talk about building an analytics-driven culture, and even peek into an analyst’s custom multi-touch attribution model. Let’s begin at the beginning: the funnel. Everyone I spoke to acknowledged that defining funnel metrics is the foundation of good analytics. But it’s a moving target. When you define your funnel’s key metrics, you can make informed business decisions and set a north star. The basic exercise, which you might well have tackled already, often starts with a simple whiteboard and marker: describe the funnel to someone and draw it out. The basic funnel for SaaS companies typically defines metrics for Awareness > Traffic (to website) > Lead > Trial > Paying Customer. Do this as a cross-functional exercise, especially with the sales team, to strengthen your relationship and define what a Marketing Qualified Lead (MQL) looks like. But inevitably things change, and this simple exercise becomes more complex as your SaaS company grows. For most growing SaaS startups with <$5M annual recurring revenue (ARR), you’re focused on initial traction, so your key metric might be around capturing interest or building an audience. A lead is “just” a new email address. But you quickly determine that not all leads are created equal—maybe you’ve started to target demos in an enterprise segment in addition to your free trial. So you begin to tailor your high-funnel efforts to capture leads based on down-funnel metrics. Your key metric might change from leads to qualified leads, or a deep-in-product activation event, or pipeline generated. With broad strokes, you start to understand what these various lead definitions cost. By the time you get to the $5–$10M ARR range, your funnel deserves an update: your business goals have likely evolved and you’ve probably added new programs. Revisions should happen again when you surpass $10M. Perhaps you’re moving into new markets and refining customer relationships. You invest more money into channels where you’re seeing signs of success to test their potential for scale. And while your channel portfolio is getting more complex, your funnel probably is too. It’s the combination of channels—SEM, a few pieces of content, a retargeting touch, and a series of nurture emails—that drives a lead all the way from awareness down through the bottom of the funnel over the course of a few months. Tying all that together with data is hard. The best way to keep pace is to regularly revisit how you calculate funnel performance metrics. As you’re setting quarterly goals, for example, it’s helpful to think about how you could push your team’s understanding of the mechanics of your customer acquisition efforts to the next level. Make your metric definitions more granular over time and “raise the floor.” That’s a phrase we use a lot at Mode to always increase the quality of the leads we pass over to the sales team as we learn. Early on, your lead volume might be low or inconsistent, and you might pass a higher volume of leads over to the sales team so that you can learn more quickly what differentiates a great lead from a mediocre one. With a feedback loop in place, you can “raise the floor” by adding more rigor to your success metric definition as you grow. Funnel revisions also help you keep up with improvements in your analytics tech stack, tracking capabilities, and individual channel performance clarity. And if you can allocate more resources to marketing analytics, you might start tinkering with an attribution system that gets you thinking about the system as a whole. You’ll also be able to hire marketers with data-first mindsets. They will be direct conduits to your company’s analysts, the data experts, which will keep your marketing efforts performance-focused. This exercise is more fruitful with more data, so one key tip is to track everything. Collect as much raw user behavior data as possible, as early as possible. It should be broad and deep. You might not use it all right off the bat, but down the line your metrics will get more granular, and you’ll want as much historical detail as you can get. But don’t just take it from me. Let’s see what analytics best practices look like at Unbounce, Algolia, and Typeform. The marketing and sales teams at Unbounce have shifted their metric definitions along their funnel as they’ve grown since 2009, serving more and more Ms than Ss in SMB. Jonathan Marsan is a marketing analyst who acts as an internal consultant, helping a team of marketing and sales folks solve problems with data. “Like many other B2B SaaS companies,” Jonathan explains, “Unbounce focused on leads and paid trials as our key metric early on. But over time, we realized that not all the leads we’d been attracting were valuable or profitable—and this was because ‘lead’ as a metric hadn’t been well defined.” Unbounce had been treating small- and medium-sized business leads in the same way. Over time, they updated the definition of a qualified lead to only focus on medium-sized businesses, and to further qualify these based on business type, pages visited, and a few other criteria. Unbounce also realized that they needed to think about more than just leads as their key metric. “We still think awareness is important to measure,” says Jonathan. “Awareness” was initially just a blanket term for all website visits to unbounce.com. But over time, they decided to shift their focus to first-time visits, because they cared more about new users discovering them. Unbounce also began to examine which sections new visitors landed on to better understand which channels drove traffic to different parts of the business. First-time visit data also helped weight channel importance in the path to website conversions. Jonathan says the team has been working their way down the funnel with metric refinements, all the way to segmenting LTV in various ways to highlight which channels and customer segments are the most valuable. Algolia is a search product, so they offer a tool in onboarding that lets users upload a dataset and play around with it. This upload action is registered as “activation,” so that their marketing communications tools can send automated emails to shepherd users through the product (or encourage them to activate, if they haven’t yet). But they raised the floor on the metric: in order to be considered truly activated, a user needs to upload their own dataset, not the sample IMDB database that Algolia provides for demonstration purposes. It’s this distinction—whether someone is serious enough to upload their own site data or not—that makes Algolia’s activation metric so helpful in predicting future business. Here’s another example of a changing funnel from my own company, Mode. When we were just getting started, our key metric was “Total Daily Signups,” and the corresponding conversion rate from site traffic. These days, we track “Net New Signups” separately from in-organization growth. That is, if one person at a company uses Mode, we want other people at their company to start using Mode as well. Many other SaaS businesses, like Slack and Asana, rely on this type of growth. In all of these businesses, in-organization growth can increase your Average Contract Value, drive upsells and renewals, and bolster retention. All good things, but none of them generates new business. Parsing our signup types was critical for getting a handle on early marketing efforts—and it’s a great example of how setting up the right tracking and definitions in your analytics stack can make or break your ability to clearly understand the initial conversion step. As you continue to refine your funnel, remember to align with non-marketing functions such as sales and customer success, because marketing metrics blend into other functions. For instance, who owns retention and churn? So, what does the typical B2B SaaS funnel look like? It varies widely from business to business, but we asked Unbounce, Algolia, Typeform, and Envoy what they track. Here’s what they said—but please remember that these funnels are purely illustrative to show variety across companies, and that they’ve been simplified for the purpose of this book (and as we know, they’ve likely changed). As you develop your funnel, make sure you empower your teams—marketers, analysts, and any cross-functional folks involved—with a discussion of why each step is important. Ensure that you have a plain-English description of each metric, which lets you start conversations about data in real marketing contexts and helps you ask the right questions. In the majority of companies, marketers need to work with analysts and engineering teams to instrument their applications, create reliable funnel reporting, and answer ad hoc questions. The way that these questions are asked makes all the difference in getting truly helpful answers. Usually, asking open-ended questions is better than asking for a prescriptive data pull. When it was time to start building out our data warehouse at Mode a couple of years ago, we worked directly with our analytics team to talk about what we hoped to be able to understand more completely in the future. After this experience, I wish I could shout from the rooftops to every marketer out there to go learn about data warehouses and how easy it is to get all the data you care about into one place. As we started to pipe all of our page load data into Amazon Redshift, I started asking how we could better understand the impacts of referral traffic on our customer acquisition efforts. Everywhere I’ve worked in the past, this exercise is a quagmire of UTM parameters, messy data, and frustrating dead ends in Google Analytics. Instead, because of the open dialogue we had with the analysts who knew what was possible, we were able to take a step back and talk about the insights we were trying to find, both short- and long-term. From there, we took the time to map out rules that we can easily update as we bring on new channels. We took the time to collaboratively define the hierarchical rules for referral sources, landing pages, and URL parameters. We can spin up new programs, knowing the reporting will work instantly. This confidence leads to more experimentation throughout our efforts. My team can easily produce consistent analysis without constantly asking the prescriptive questions that preclude analysts from answering the hard questions. As marketers, we should welcome the “why?” from analysts. You’ll get to better decisions, faster, if you spend the time answering “why” a few times up front. They’re not questioning your need for the data, they’re just trying to understand how to best contextualize the results. For example, if you ask how many people invite other people in the sign-up flow, there’s no “why.” You’ll probably just get a number. 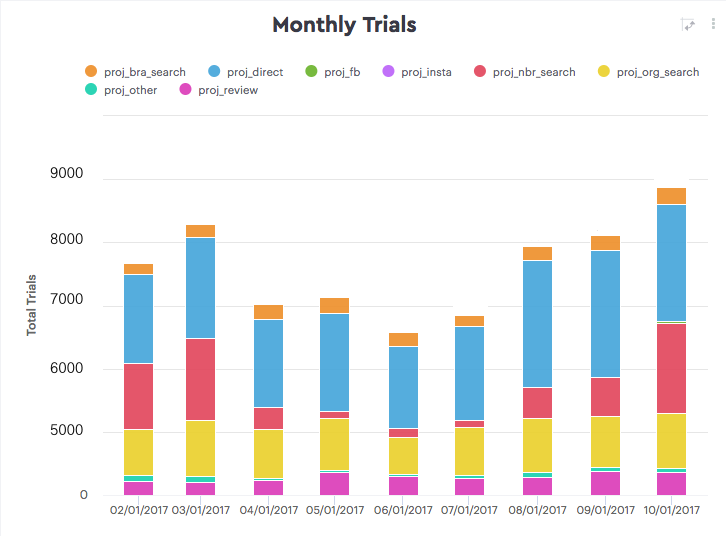 If, instead, you say “I’m exploring how we might mix up the order of the signup flow steps to drive more activated trials, but I want to understand the potential impact on invite growth rates,” you’re going to get way more than just a number—and you’ll ultimately be able to make a better decision more quickly. A culture of internal discussion also allows for corrective actions. Jonathan tells about a time when the content marketing team had been pulling metrics on their own. One day they sat down with him and openly discussed what they’d been reporting on. A valuable and illuminating conversation followed, which helped them to refocus their reports in a way that guided the editorial calendar decision making. As your SaaS company grows, your marketing channels get more complicated. And so does the analysis they require. You start to invest more money in marketing, including big-budget traditional channels and new experimental channels. You want to know where you should be investing more and what you should turn off. Multiple marketing channels interact as they shepherd a customer to purchase. As a SaaS business, your buyer’s journey may be complex, with five, ten, or even thirty marketing touches. You start to think about multi-touch attribution to understand the influences of different campaigns. Your multi-touch attribution starts to feel blurry as people interact with your brand across devices, reading your content on mobile and coming back to activate when they’re at their desk at work. But people are people, not devices, and you’ll want to find a way to reconcile it as best as possible. The trick to managing this complexity is to think ahead while you’re still small and lay the groundwork for an analytics system that’s more advanced than you currently need. It’s like moving into a home with a spare bedroom if you know you want to grow a family and can afford the advance planning. Let’s see how Typeform and Envoy have experienced these issues and begun to put analytics in place that will accommodate where the company wants to grow. Typeform was founded in 2012 and according to Sançar, their growth has been very product-driven, thanks to a “Powered by” button on their “typeforms” that creates a viral loop of signups. They started to develop a new marketing analytics system in earnest at the start of 2016, and worked through some common questions: Do we get someone from our data team to specialize in marketing analytics skills, or do we add an analyst to sit under the marketing team? Do we build our dream analytics tooling in-house, or purchase it from an outside provider? “But the big challenge for us, as it is for most marketers, is multi-touch attribution and cross-device analytics,” says Sançar. Typeform works really well on mobile, and when users see the “Powered by” button, they get curious and start to research the site on their phones. This mobile discovery is driving a ton of traffic for them. They see positive impacts on the acquisition funnel, but it’s tough to tie the funnel steps together perfectly. One reason for this is the typical mismatch between identities across devices. If we could wave a magic marketing wand, we’d have every person, across all their devices, use the same email address when they identify themselves. When you’ve moved beyond Google Analytics and are using your own session data, you’ll typically know the “anonymous_id” of the person. With cookies, you can tie a few anonymous sessions together using this ID. And then in the fourth session, when they finally give you their email address, you can finally say “okay, all four of those sessions were Jane.” That’s great. You can start answering questions about the number of visits it takes before someone tells you who they are. This is complicated by the fact that when you change devices, you’ll have a different anonymous_id. So, let’s say your user was using their mobile device to read all your content for a few months, and then they finally sat down at their desk at work to sign up. They used their work email address. Now you can’t use the email address as the link. In your reporting, it will look like you’re getting a ton of mobile traffic to your content that “never converts.” With lead enrichment and other tools, you can use other identifiers to start tying things together, but it’s always pretty fuzzy. To give the analytics system continuity so they track all users as they jump from mobile to desktop. Now let’s see the attribution solutions Envoy has created to lay a foundation for future growth. Envoy is the company behind Envoy Visitors, the iPad sign-in system used by thousands of offices worldwide. Because everyone who visits these offices interacts with the Envoy product, virality is an important part of their growth strategy. Arvind led the charge to develop a rich attribution model. There was one particular marketing campaign that precipitated this: a three-month retargeting pilot with AdRoll. Envoy had used retargeting before, but they wanted to find the most profitable audience segments and ad variants before investing more in the channel. A good attribution model would help them reap the benefits of this retargeting campaign and make room for sophisticated tracking in the future. After researching different solutions, they decided to build it in-house instead of using software providers’ native reporting platforms. This would avoid double counting and meet any unique internal needs. We’ll look at two iterations of the unique attribution model Arvind developed and the tech stack that powers it. The first version was a first-and-last-touch attribution model—the first and last touch a customer received were each weighted 50%. (To learn more about different types of attribution models, including first and last touch, check out this primer.) This was easy to understand and calculate. It struck a balance between crediting the awareness marketing campaign that brought Envoy to the user’s attention (the first touch), and the conversion campaign channel that finally got them to create an account (the last touch). Awareness and conversion campaigns could be measured together. But this didn’t give credit to the in-between touches that cultivate intent—the upcoming three-month retargeting campaign, for example, would be left out. And for a company like Envoy, with long sales cycles, those middle touches are critical. So, the second version was a custom time decay attribution model that gave weight to touches all along the buyer’s journey. In a standard time decay attribution model, all touchpoints get some credit, but touchpoints that are closer to the conversion (at the end of the journey) get more. This is calculated by setting a decay half-life and then normalizing touchpoints to add up to 1 (or 100%). 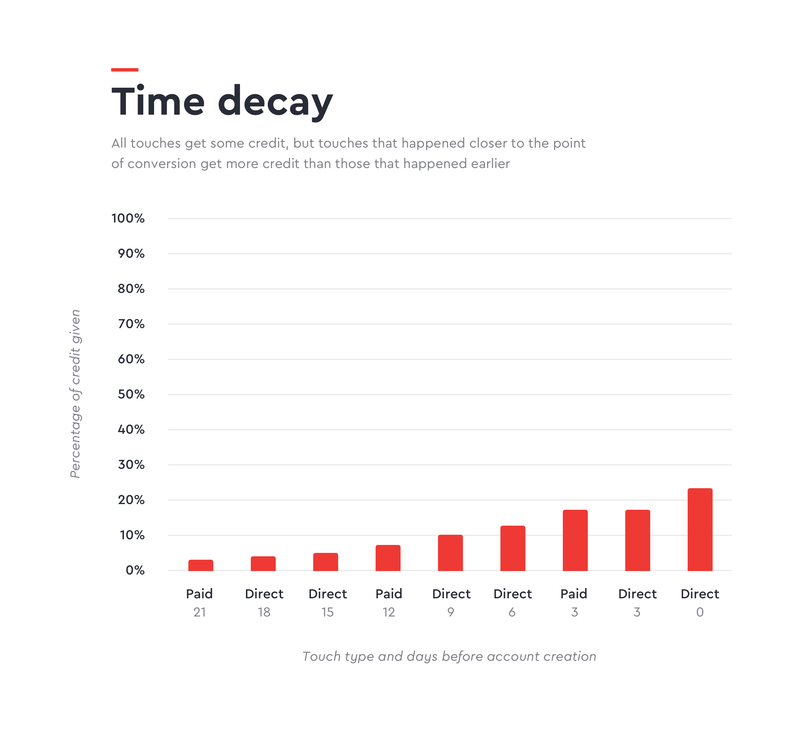 Here is an example of how a time decay attribution model would assign credit to the touchpoints of a customer who had nine touches before conversion. But this model needed some tweaking. 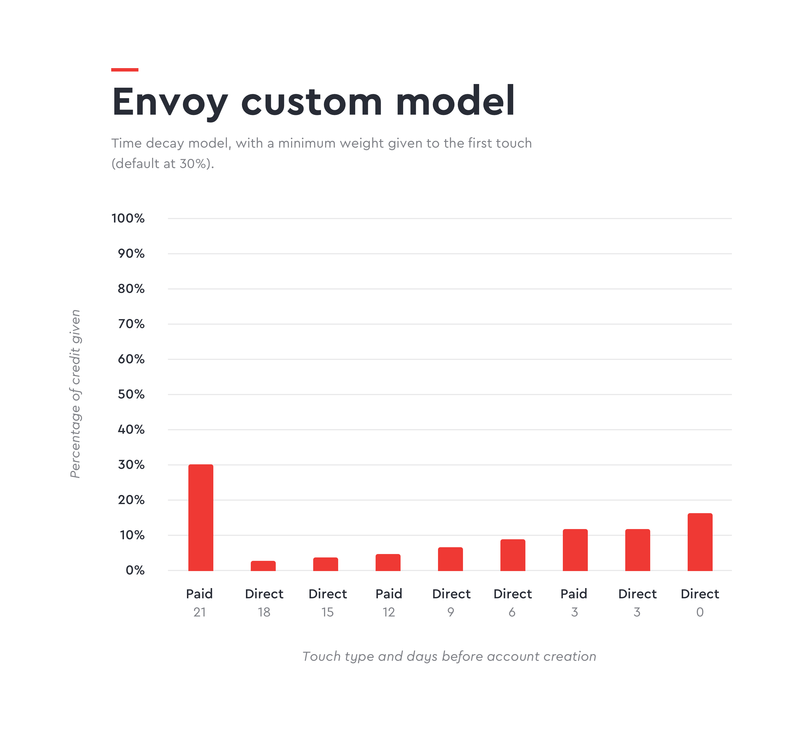 Standard time decay gives the least credit to the first touch, but for Envoy, top-of-funnel awareness is a big driver of growth that should be accounted for. Arvind customized the time decay model to more accurately account for the importance of the first touch by giving it a minimum weight. This meant that the first touch always received a minimum amount of credit, defaulting to 30%–40% (the exact number could be changed within the model). So if a user’s first touch was below 30% in the time decay model, they reset it to 30% and normalized the remaining touches. Here’s an example for the customer with nine touches. The click-through window that comes right after a paid touch defaults to 48 hours, and it’s also customizable. Any direct touch that happens within two days of viewing a paid ad gets attributed to that campaign, and a new paid ad resets the window. Having these parameters in the model lets marketers change inputs quickly without having to rewrite any SQL. Here is a sample Monthly Trials chart, which shows how trials are being credited to Envoy’s various online channels through the attribution model. Now let’s look at the analytics tech stack that makes this possible. Envoy uses Heap for event tracking. It collects session data and notes who looks at which pages, when they look, what channel they came from, and more. It also tracks the movements of anonymous visitors. Heap started tracking all activity when Envoy first installed it, so now when Arvind wants to examine an event, like someone clicking a certain button, he can just define that event and see who’s clicked as far back as the initial Heap installation. Heap data goes to a Redshift database using the Heap SQL feature. They also use Stitch to send other data to Redshift from sources such as AdWords, Facebook, AdRoll, and Stripe. All this combined data allows Envoy to implement their attribution model. They can analyze marketing channels side by side and bring cost data into the equation, which lets them calculate things like weekly LTV-to-CAC ratio. For one channel in one time frame, they can see how people are using the product, the signups, activations, and the paying customers who are still with Envoy. Calculations, visualizations, and models are accessible in Mode, where they build reports for the marketing end user. Even if you can’t invest in custom attribution models yet, becoming comfortable with data will take your marketing much further. It’s not just about getting comfortable with reporting, but about learning how the systems work. When you know how data moves around—from your ad platforms, your application, and even a CRM—a whole new world of questions opens up. When all you know is Google Analytics, you’ll only ask Google Analytics questions. And those aren’t going to be the ones that get you to CAC nirvana. Be clear about your marketing funnel and what each metric means. Use your storytelling superpowers to engage analysts and collaborate with them to find answers to business problems. Get technical as you lay the analytics groundwork for your company’s future growth. This combination will give you the language, the organizational connections, and ultimately the metrics your team needs to do its best work.